In one of the All in the Family episodes that aired some years ago, Edith and Archie are attending Edith’s high school class reunion. 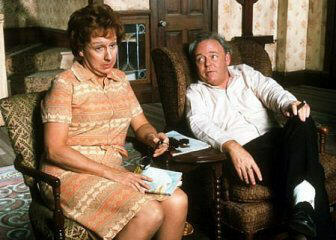 Edith encounters an old classmate by the name of Buck who, unlike his earlier days, had now become excessively obese. Edith and Buck have a delightful conversation about old times and the things that they did together, but remarkably, Edith does not seem to notice how extremely heavy Buck has become. Later, when Edith and Archie are talking, she says in her whiny voice, “Archie, ain’t Buck a beautiful person.” Archie looks at her with a disgusted expression and says: “You’re a pip, Edith. You know that. You and I look at the same guy, you see a beautiful person, and I see a blimp. 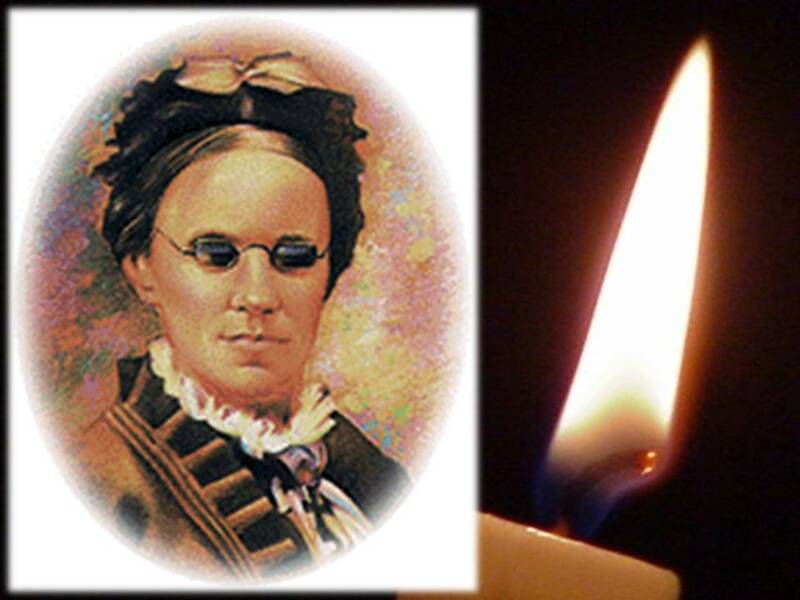 Edith gets a puzzled expression on her face and says something unknowingly profound, “Yeah, ain’t it too bad.” Do you see Jesus Christ as the True Light? Matthew reveals another side of the True Light. In the True Light of Jesus Christ, we find Hope! Hope is definitely not the same thing as optimism. It is not the conviction that something will turn out well. However, the certainty that something makes sense. Regardless of how it turns out. You may react to his definition of hope, because as Christians, we are taught that all things will work for good to those who love God. However, what we usually think is that it will work out for my good. It certainly did not work out for John the Baptist’s good to have his head cut off. It certainly did not work out for Stephen’s good when he was stoned to death. But we do know that everything that happens, regardless of how it works out, will make sense! Why? Because Jesus is Lord and He is in Control!! The only ones who lose hope are those who believe God is not in control! Job 17:11 My days are over. My hopes have disappeared. My heart’s desires are broken. Job thought that God was treating him unjustly. He could not understand God doing this to him. He imagined that God was making a mistake, that He was not in control. He had all kinds of questions and arguments he would lay before God if he could only get the chance. Finally, God spoke to Job, and Job was silent. Job encountered the great I AM, and knew that He had been in control the whole time, and it all made sense. Does your life make sense? Have there been times when you were like John the Baptist, wondering what was going on, wondering where God was, wondering if He was in control? Or were like Job, thinking God was unfair, wanting to argue with him. Did you get offended at what was going on? Did you get angry, hurt, upset? Did you lose hope and give in to despair or depression? 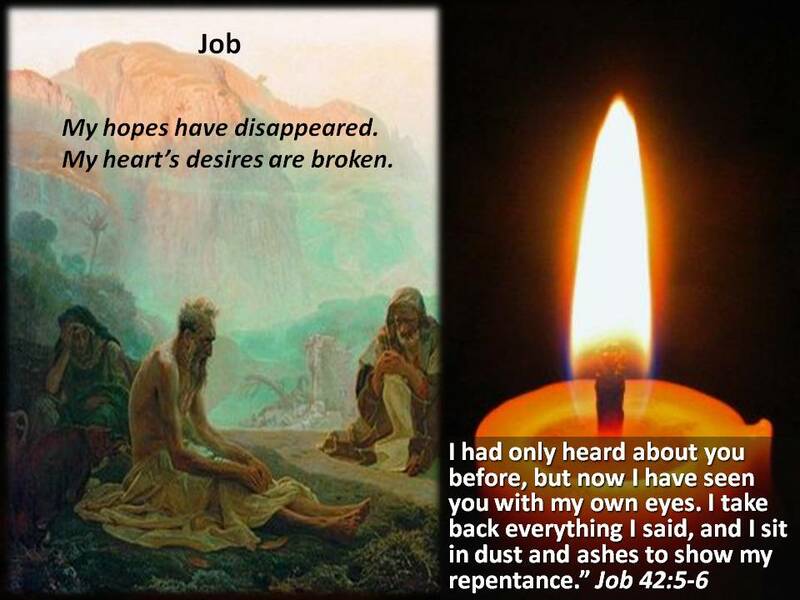 Did you moan with Job “My hopes have disappeared; my heart’s desires are broken?” Let us look into the Light of Jesus and discover why we should never lose hope, no matter how dark things get. 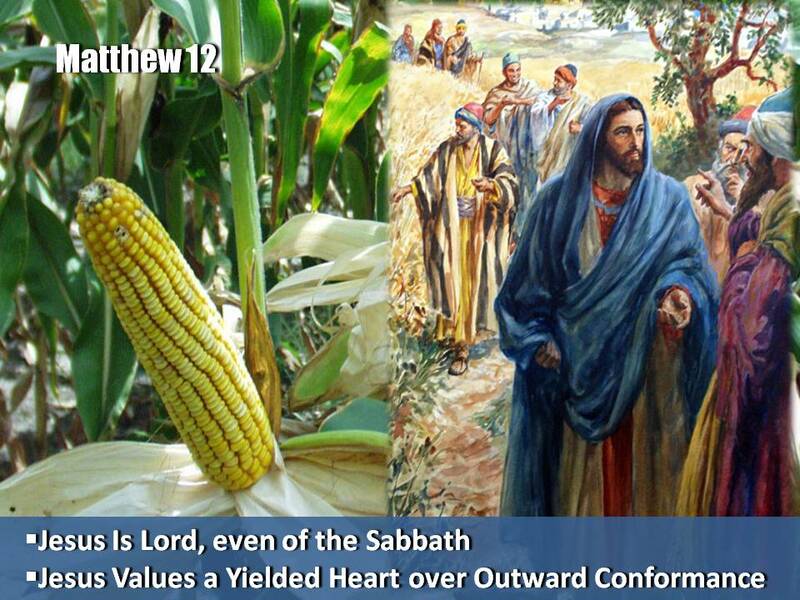 1.Jesus is Lord, even of the Sabbath! If we rest, we rest in Jesus, for He is Lord! 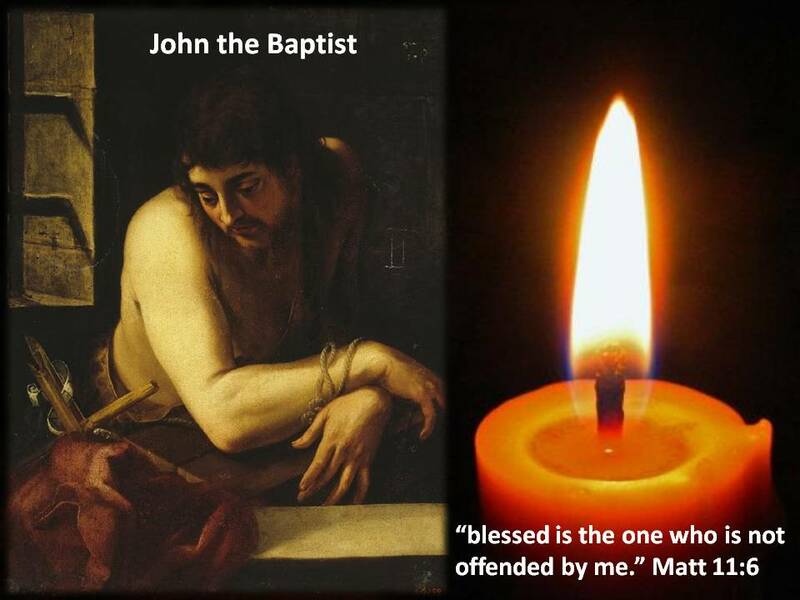 Do not get offended at Jesus. What He does is right, it is just, and He is Lord! 2. He desires a heart that is yielded to Him rather than ‘outward conformance’ or even performance. Only yielded hearts will survive the trials and tribulations of this life! Fake people always wilt under pressure. Just because you put on a good show of being a Christian does not mean that inwardly you are struggling with doubt, with fears, with despair and with depression, with sins. You can put on a good show, but Jesus knows your heart, He knows whether you are real or fake. Peter presents the heart of a true Christian in six simple verses. This Christian has a new heart, with a new hope, a hope that endures through the fire of trials! 1 Peter 1:3-9 Blessed be the God and Father of our Lord Jesus Christ! According to his great mercy, he has caused us to be born again to a living hope through the resurrection of Jesus Christ from the dead, to an inheritance that is imperishable, undefiled, and unfading, kept in heaven for you, who by God’s power are being guarded through faith for a salvation ready to be revealed in the last time. 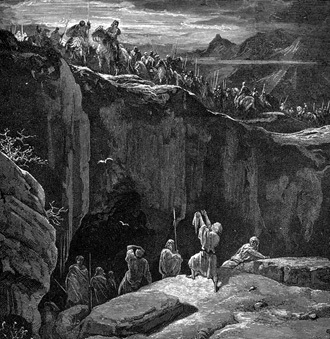 In this you rejoice, though now for a little while, if necessary, you have been grieved by various trials, so that the tested genuineness of your faith—more precious than gold that perishes though it is tested by fire—may be found to result in praise and glory and honor at the revelation of Jesus Christ. Though you have not seen him, you love him. Though you do not now see him, you believe in him and rejoice with joy that is inexpressible and filled with glory, obtaining the outcome of your faith, the salvation of your souls. 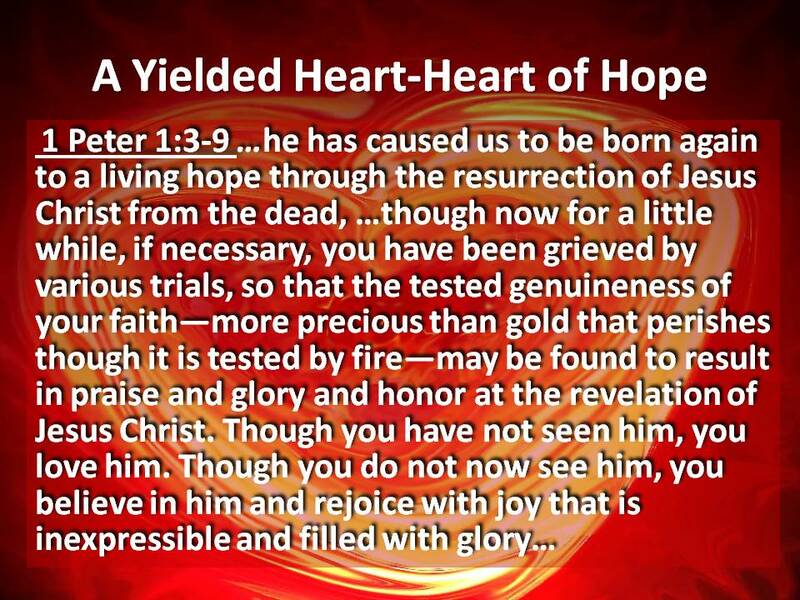 A heart that is yielded totally to Christ is a heart in Love with Jesus, it is a born again heart with a living hope! A fake Christian is putting on a display because of what he thinks he will get-favor from God. A yielded heart is confident that Jesus is Lord of whatever situation you go through! Next, we see a man who is lame in his right hand. Matthew 12:9-14 He went on from there and entered their synagogue. In addition, a man was there with a withered hand. And they asked him, “Is it lawful to heal on the Sabbath?”— so that they might accuse him. He said to them, “Which one of you who has a sheep, if it falls into a pit on the Sabbath, will not take hold of it and lift it out? Of how much more value is a man than a sheep! 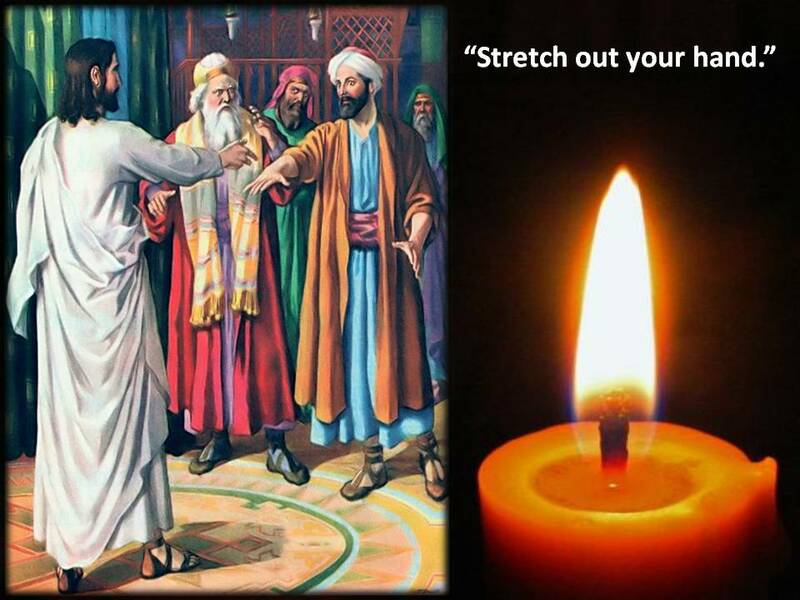 So it is lawful to do good on the Sabbath.” Then he said to the man, “Stretch out your hand”. And the man stretched it out, and it was restored, healthy like the other. But the Pharisees went out and conspired against him, how to destroy him. The Lesson here is the Lord of the Sabbath will always be mindful of your needs. His mercy is to be trusted. 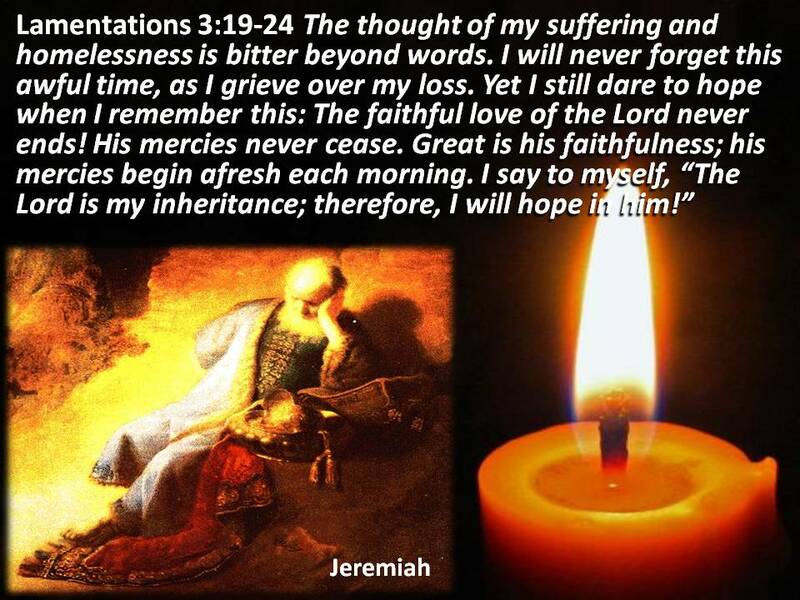 Psalms 13:1-6 How long wilt thou forget me, O Lord? Forever? How long wilt thou hide thy face from me? How long shall I take counsel in my soul, having sorrow in my heart daily? How long shall mine enemy be exalted over me? Consider and hear me, O Lord my God: lighten mine eyes, lest I sleep the sleep of death; lest mine enemy say, I have prevailed against him; and those that trouble me rejoice when I am moved. But I have trusted in thy mercy; my heart shall rejoice in thy salvation. I will sing unto the Lord, because he hath dealt bountifully with me. David endured hardship after hardship, near death experiences one after another, yet rather than lose hope and get offended at what was happening to him, he strengthened his heart in the Lord. He trusted in the Sovereignty of God, therefore he could rejoice in His salvation. He wrote this three chapters after stating 1:8-9: “For we do not want you to be ignorant, brothers, of the affliction we experienced in Asia. For we were so utterly burdened beyond our strength that we despaired of life itself…” Paul had those moments when things were so dark, so desperate that he despaired for his very life. 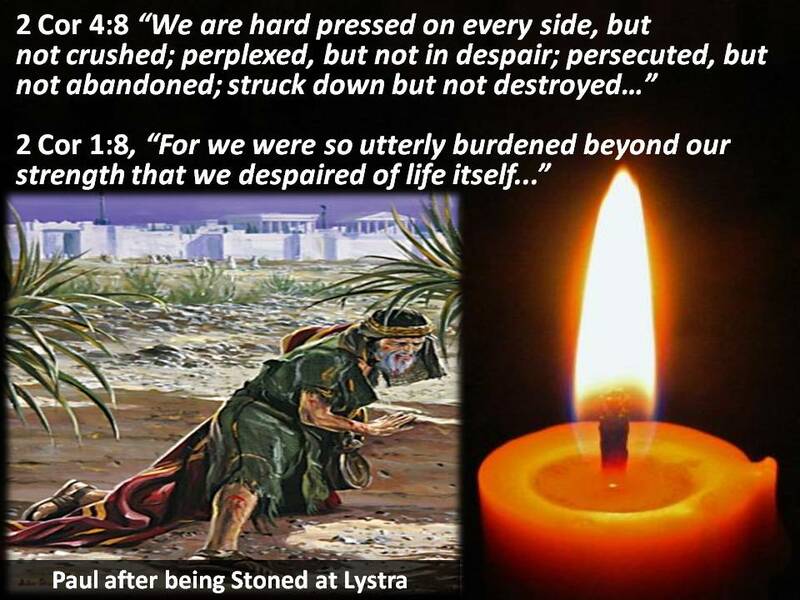 How did Paul go from one who despairing of life itself to one who is hard pressed but not crushed, perplexed but not in despair, struck down, but not destroyed, never feeling that God had abandoned him. 2 Corinthians 4:11 … so that the life of Jesus also may be manifested in our mortal flesh. Paul’s Hope was in God, Paul’s Purpose was that the life of Jesus would be manifested through his life-regardless of what he went through. His heart was in God’s hands, and therefore He trusted in Him! He trusted in God’s tender mercies! 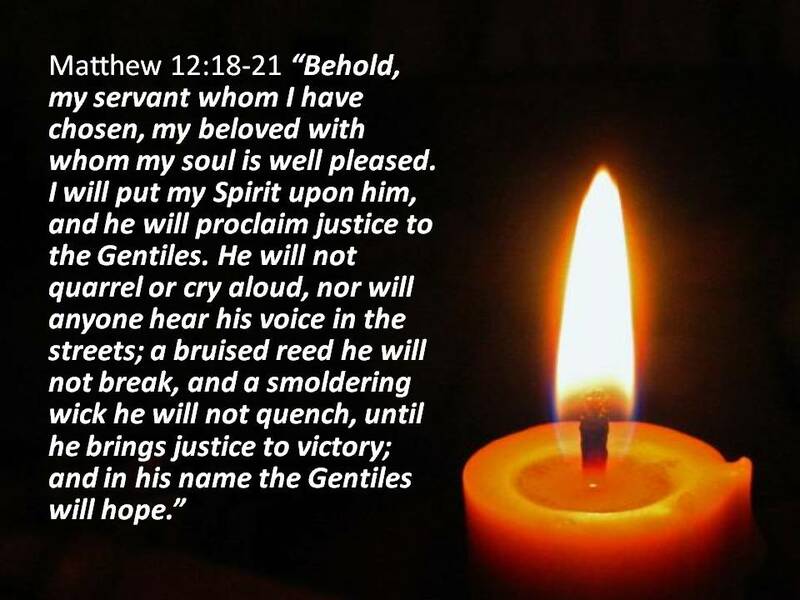 Matthew quotes the Old Testament when he declared: “and in his name the Gentiles will hope”. 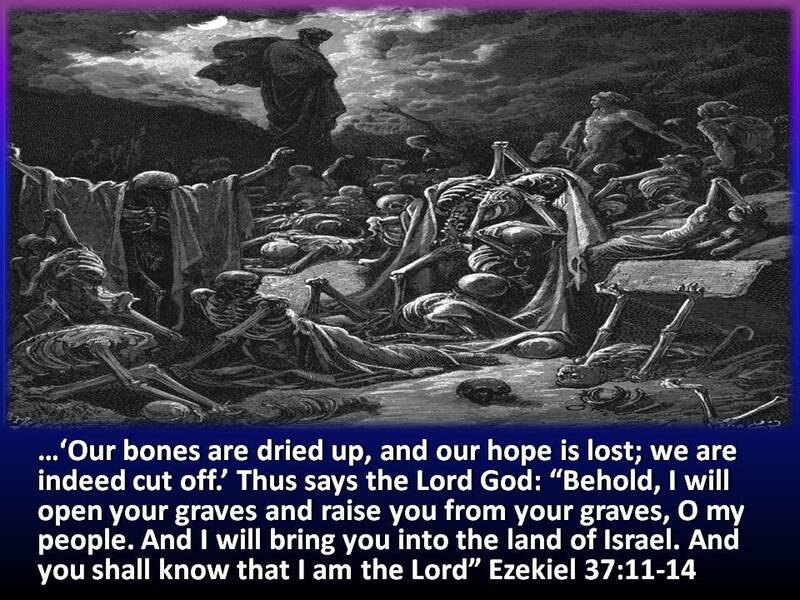 We share in the Hope of Israel! Ephesians 2:12 In those days you were living apart from Christ. You were excluded from citizenship among the people of Israel, and you did not know the covenant promises God had made to them. You lived in this world without God and without hope. 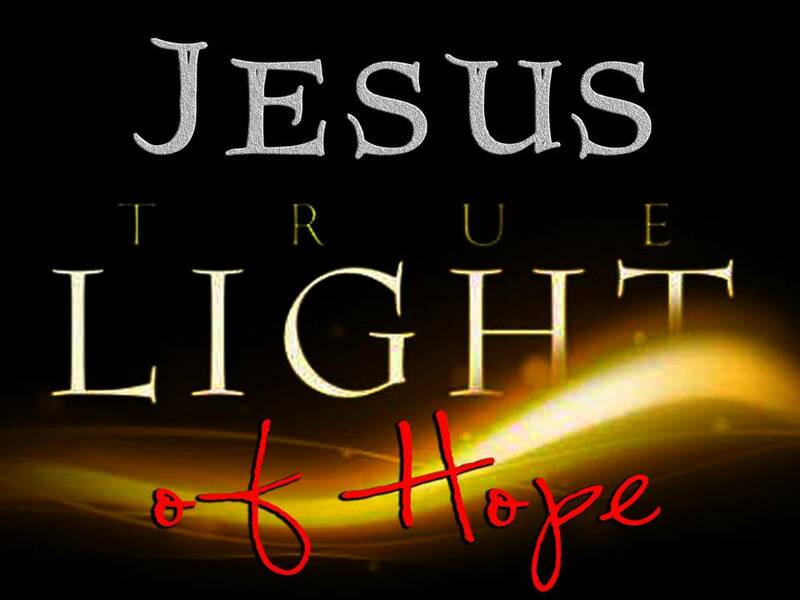 Jesus is the True Light that brings the Light of Hope to the Gentiles! “Now the God of hope fill you with all joy and peace in believing, that ye may abound in hope, in the power of the Holy Spirit” (Romans 15:13). THE HOPE OF THE BRUISED AND SUFFERING CHRISTIAN. Bruised Reed: People used reeds to make into pens in ancient times. The reed is hollow and would hold the ink. If the reed was bruised or bent, the ink would leak and become useless. The writer would break the bruised reed and throw it away. Like a pen, the reed was an instrument of expression. Therefore, I like to think of the reed as representing our voice and ability of expression. Only a dead person does not voice his opinions or share his feelings. The first thing Satan wants to do is to stop us from sharing and expressing our ideas, especially when we speak for the kingdom of God. He will make every effort to cut off our network of friends and isolate us so that we will be discouraged. SMOKING FLAX: A smoking flax or a smoldering wick symbolizes our usefulness and the ability to shine for the Lord. It is no doubt that we have been created to shine for Jesus but when we fall into sins, our wick would become smoldered. We would not shine that brightly anymore. That is when the enemy of our souls seeks to terminate that light. He does that by encouraging people around us to say disparaging words or spread malicious rumors about us. When we allow all these words and rumors to enter our hearts, we would become bitter and angry. Please take note that it is not those gossips or criticisms that smolder our wicks but how we react to them that would terminate our light. Jesus Christ is the True Light of Hope for Mankind. By his death for us, he has ‘faithfully brought forth justice’ (Isaiah 42:3) by suffering the justice of God in our place once and for all. Look now to Jesus and find mercy for your bruised and weakened soul. Receive his tender comfort, cleansing, healing and all-sufficient grace. 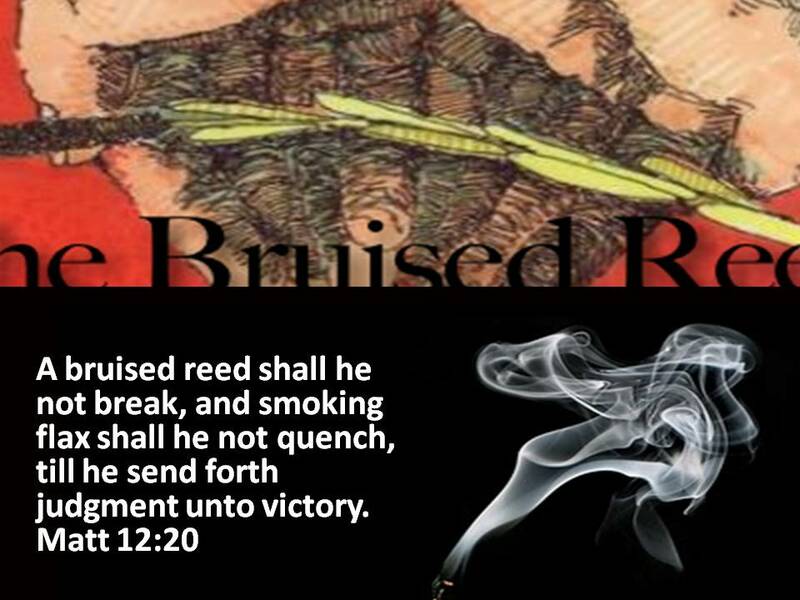 God’s great mercy in Christ is for us ‘bruised reeds’ and ‘smoldering wicks’. Hebrews 6:17-20 So when God desired to show more convincingly to the heirs of the promise the unchangeable character of his purpose, he guaranteed it with an oath, so that by two unchangeable things, in which it is impossible for God to lie, we who have fled for refuge might have strong encouragement to hold fast to the hope set before us. 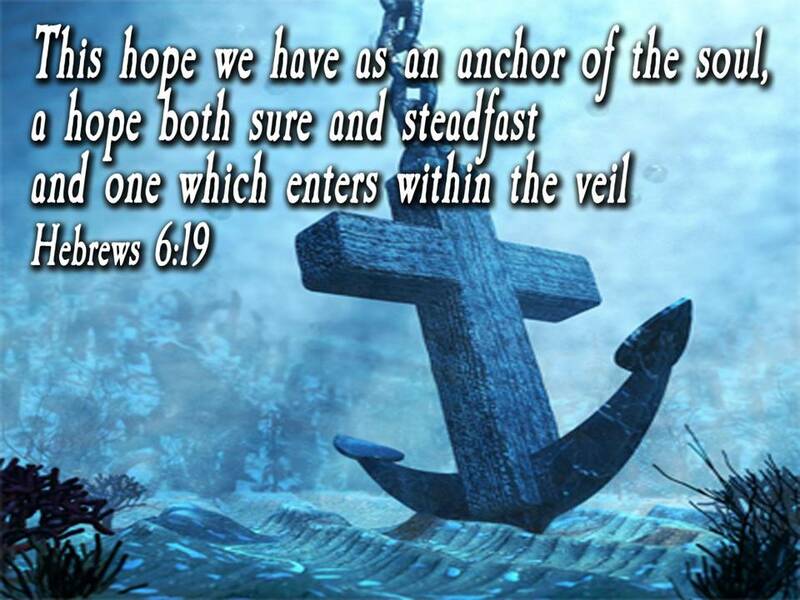 We have this as a sure and steadfast anchor of the soul, a hope that enters into the inner place behind the curtain, where Jesus has gone as a forerunner on our behalf, having become a high priest forever after the order of Melchizedek. 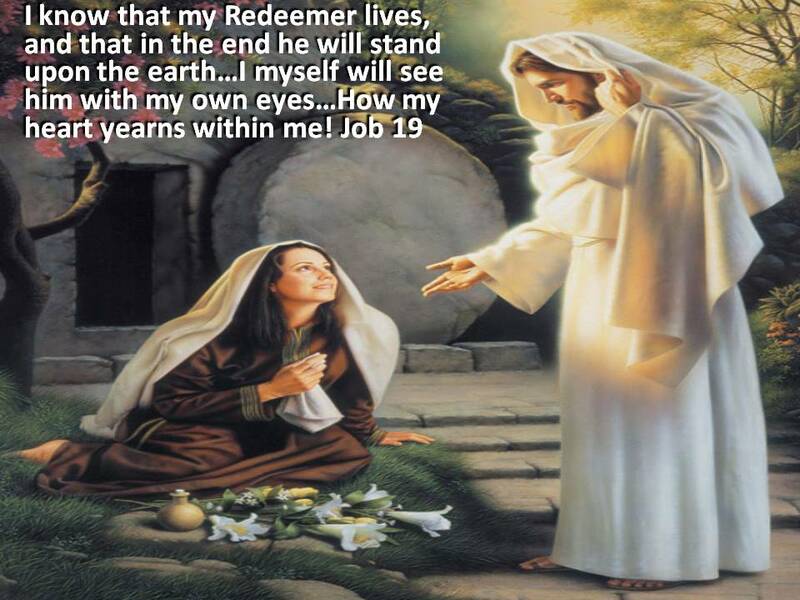 Job 19:25-27 I know that my Redeemer lives, and that in the end he will stand upon the earth. And after my skin has been destroyed, yet in my flesh I will see God; I myself will see him with my own eyes–I, and not another. How my heart yearns within me! It seemed intended by the blessed providence of God that I should be blind all my life, and I thank him for the dispensation. If perfect earthly sight were offered me tomorrow, I would not accept it. I might not have sung hymns to the praise of God if I had been distracted by the beautiful and interesting things about me. Whose face do you see in times of darkness and despair? Whose hand do you see reaching for you when things look hopeless? When you see a difficult situation do you see the Beauty of Christ, or do you just see an Ugly Blimp on your back? Let me assure you that Jesus is still Lord! He is the one who can be trusted completely! He is the anchor of our HOPE that this life does make sense to the source of life! My hope is built on nothing less Than Jesus blood and righteousness; I dare not trust the sweetest frame, But wholly lean on Jesus name. On Christ, the solid Rock, I stand, All other ground is sinking sand. When the last trumpet’s voice shall sound, Oh, may I then in Him be found; Robed in His righteousness alone, Faultless to stand before the throne. 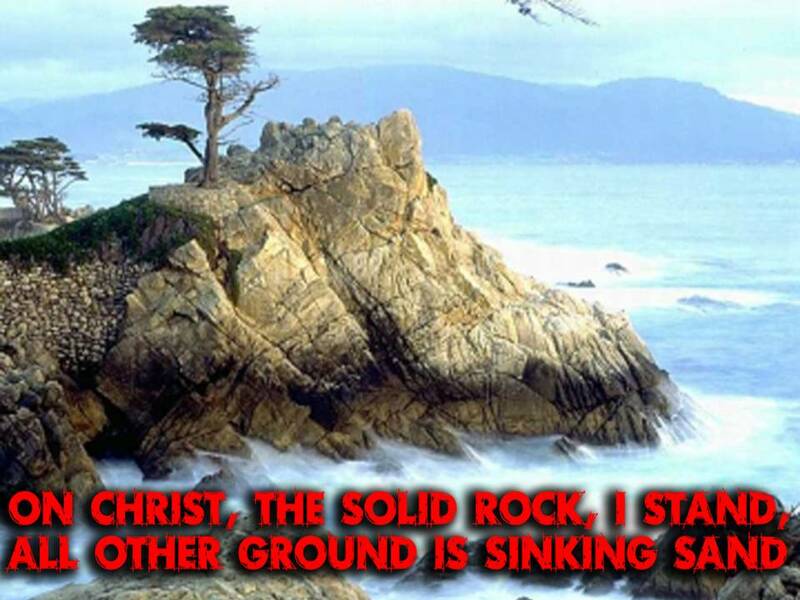 On Christ, the solid Rock, I stand, All other ground is sinking sand. Jesus Christ TRUE LIGHT of HOPE!